Open for dogs is an exciting new scheme whereby businesses and tourist attractions are promoted as dog friendly places to visit. Being able to pop to the shops and take your dog is a boon for owners when in the past they have had to risk leaving them outside the shop or worse still in the car. Being restricted where to go when you have a dog can be a dilemma. There is nothing more irritating than planning a family outing to discover that the dog is not included and either has to stay at home alone or sit in the car all day while the family have a great time. Leaving a dog at home serves no purpose as he will be lonely and could also become destructive. Leaving him in the car for hours on end is not healthy for the dog. In hot weather he could over heat and die. A car becomes as hot as an oven within minutes. The Kennel Club ‘Open For Dogs’ scheme encourages shops, libraries, cafes, restaurants and places of entertainment to allow well behaved dogs to accompany their owners onto their premises. Many such places usually only allow access to assistance dogs so this scheme is an exciting development for dog owners. Obviously dogs will not be allowed where food is prepared. Many beaches in the UK ban dogs during the height of the summer season so a list of dog friendly beaches is a great boon for holidaymakers. Dog friendly holiday accommodation is encouraging owners to holiday with their dogs rather than board them in expensive boarding kennels while they travel abroad. In these credit crunch times taking the dog on holiday can be a big money saver. Businesses that are Open to Dogs are asked to contact the Kennel Club for a sticker to display to the world that they are dog friendly. They will be linked to the Kennel Club website which will not only tell the world that they accept dogs but should bring in extra business from dog owners researching days out with the dog. Members of the public can also nominate businesses as being canine friendly. Each year the Kennel Club has a competition for the most dog friendly places which is very well promoted and shows that there are many places that welcome dogs and are proud to say so. The Open for Dogs website not only shows the businesses that support dogs and their owners but gives tips for canine etiquette. Tells how dogs should behave in the workplace and also shows the latest news about doggy days out. Dog owners are able to upload photographs and videos of dog friendly places. For businesses that are not sure what they can offer to a dog owner the Kennel Club gives suggestions. Fresh water, ideas for walks, details of local vets, supplies of poo bags and even a canine menu are just some of the helpful ideas. One of the winners of the latest 'Open for Dogs' competition supplied throws to cover the beds and chairs in their cottages which meant that dog owners need not worry about stray dog hairs on the furnishings. Anything that makes man’s best friend more acceptable in public places is a fantastic idea. With this in mind the Kennel Club have come up with a winning formula. 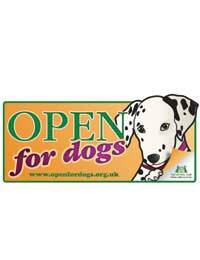 For more information or to register a dog friendly business, contact the Kennel Club 'Open for Dogs' at their website.